The consumer HDD market is slowly imploding, but while it's roughly half of all drives sold that's not where the money is. The Enterprise HDD market is doing better. Sales are down a bit; but while Seagate/WD/Toshiba don't break the two segments of enterprise drives out, it's probably from SSDs chewing into 10/15k drives in servers not the high capacity 3.5" drives used for bulk storage. Seagates comments about the next gen of 15k drives potentially being the last tends to back this up, since they're talking about multiple generations of other drive types. That patent  is clear example how current patent system is out of control and not useful to society at large. Short recap, patents original idea was to give temporal monopoly to inventor who disclosed his invention. There was no right to own anything you invented, but it was seen that disclosing the invention would ultimately benefit society who, after temporal monopoly, could use the invention. Now opposite is true, there is nothing useful disclosed in Seagates patent! But we grand Seagate sole ownership to use Gold with Cu, Rh, Ru, ... or Mo in concentrations of 0.5-30% in HAMR NFT. How does this benefit us? Of course Seagate can't stop WD to use same alloys as WD have similar patents to sue back, but they both can stifle smaller competitors. I don't think there will be any more competitors in HDD space, but same applies to other fields and their patents. Nobody accounts the relative speed of price reduction. SSD will get cheaper per gigabyte than SSD before 2020. We will never see HDMR HDD. And there is a chance we will not even get HAMR. I'm not sure about this. On my laptop, I've got a 120 GB SSD I got ages ago along with a recent 2 TB drive. Both cost about the same when new. 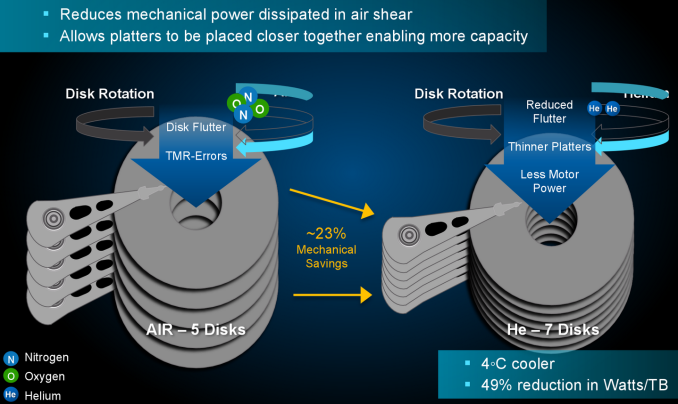 I think HDDs will continue to get bigger and cheaper faster than SSDs, at least until some new process tech allows for very high flash densities and low production cost.